Our historical newspaper collection can give you a glimpse into the world of your ancestors that would be hard to find anywhere else. Find obituaries, and announcements about births, engagements and marriages. Read accounts of local sports, school, and community events. Newspapers can bring to life the communities your families were living in, be it small town or a big city. 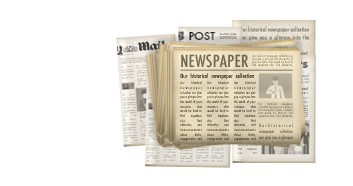 Newspapers are an indispensable resource for historical and genealogical research. They help you to fill in the gaps in your family tree and turn names on a page into real people.